Punjab and Sind Bank (पंजाब एण्ड सिंध बैंक) is a government of India owned bank whose headquarter is in Delhi. It has at present 1466 branches all over India of which 623 are in Punjab only. To enhance the customer experience, the bank has introduced a wide range of exclusive services. If you are a customer of this bank and if you have any instant need of your account balance information, you may choose any method that the bank provides to its customers as a part of its service. 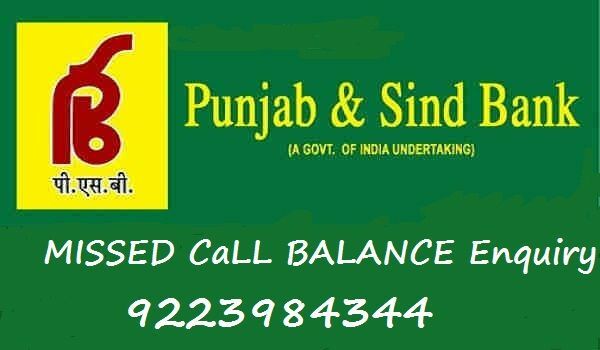 Like other banks, Punjab and Sind Bank also provides missed call services to its customers at free of cost and when the customers send a missed call to the Toll-Free number 9223984344 from their registered mobile number, the customers may able to know their account balance. This is also another convenient method among the customers to about their account balance. Just SMS to 9773056161 or 8082656161 from your registered mobile number under the format "PBAL <Acct No.> <SMS Banking Password>". This will help you to know about your balance. If you want to get your account balance information from the bank, you may contact any representative through its Toll free number 18004198300 and within few minutes you may get your current balance update. The Interactive Voice Response Service or the IVRS is an exceptional method of contact the bank has introduced in 2012 in three languages- Hindi, English & Punjabi. With the help of this method, the customers of the bank easily check their account balance. It is an instant method that helps the customers to know the last 5 transactions details. Not only that you can also get information about your cheque status from this system. Visit a Punjab and Sind Bank branch which is close to your location, visit the bank's help desk and take information about your account balance and take a hard copy as a proof. Sir plz send me SMS to m email. my account balance of information gives me.